Practical. Clean. Uniformed. Tile is the most practical, popular product amongst many homeowners owing to many reasons; it's easy to clean, it looks effortless, great for rooms prone to water spills and there are so many types to choose from, you are bound to find the perfect time for your home. Tile is endearing and can leave a wonderful impression when fitted correctly. There are so many varieties and styles to choose from, you are bound to find the perfect tile to fit your room or living area. Tile is one of the favorite practical choices when it comes to rooms such as kitchens, bathrooms and basements where humidity and spills are present. If you want to install tile in another recreational areas, there are beautiful options and materials you can choose, such as, slate, marble, porcelain and ceramic. As you can see, we offer you any type of tile with endless choices of designs, colors and patterns for your heart’s content. Head on over to our showroom to select the perfect tile for your home and don't worry, our experienced store representatives are waiting to guide you with your selection. There are so many advantages to tile flooring, we could really go on and on! With its practicality, tile is also effortless when it comes to maintenance. Apart from that, it's a wonderful design feature to add as a backsplash on a wall or on the floor itself. With a choice of marble, ceramic, clay, porcelain , glazed or matte, you really can't go wrong with selecting a beautiful tile to add a magic touch to your home. Gregory’s Paint & Flooring design experts have compiled a beautiful tile flooring gallery to give you inspiration for your next flooring project. You can browse through a lovely range of ideas that will help you choose what will work best in your own home. Carry on reading to see all the images. Tile installation can be tricky as there are a lot of impractical requirements in order to fulfill a successful installation. This is why we essentially recommend that you hire one of our installers so that you can sit back, relax and know that your flooring is being taken care of by a skilled specialist that has the know-how and correct tools. Find out more about tile installation and it’s respective stages here. 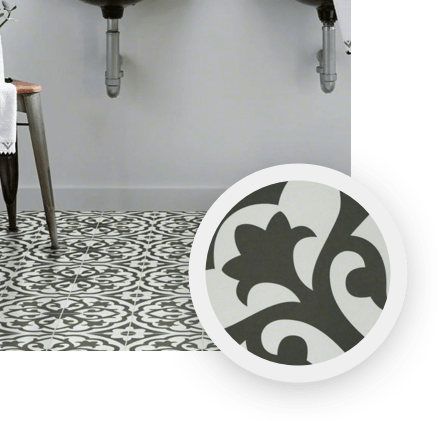 As we mentioned, tile is one of the easiest flooring solutions to maintain and care for. For the most part, spills wont stains and it’s highly reliable when it comes to humid areas in your house. With the right practice and cleaning supplies, you can keep your tiles looking brand new overtime. Take a look at our expert’s pointers and guidelines. Get to know some of the names we trust the most! Create a space for your entire family, even your pets!